Both RV slide out mechanisms use 12V motors to provide power to operate the mechanism and generally include a means to extract the room by hand in the event of battery failure. The 12V electric motor used to power the RV slide out mechanism draws considerable current. Whenever possible, plug your RV into shore power and/or run your engine before operating your slide to help reduce the strain on the 12V electrical system. The motor is usually controlled by a circuit board and relay. There will be a fuse located on the circuit board or in the power line that supplies the motor. 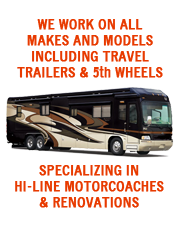 If you're experiencing problems with your RV slide out please take it to an RV repair center to have a certified RV service technician look at it.